As I continue in my quest to write my way through my finished projects, I thought today would be a fun day to share a little pre-Tour de Fleece spinning. You see, a couple days before the Tour de Fleece kicked off I found myself battling some bad migraines that left me not feeling like doing much. One night, I finally felt ok enough to do some spinning, but didn’t have the energy or attention span to do anything super technical so I grabbed 3 braids of fiber that I had intended to spin in simple squishy 2-ply yarns and just started spinning. First, was a gradient from Fiber Optic Yarns that I picked up a few years (yup — years…) back at the WI Sheep & Wool Festival. And I really adore how the fiber spun up. I can easily see this knit into a very fun winter hat. This was 100% Targhee named ‘Mutant Flamino’ and this one, well, I knew it would be a great chunky yarn. 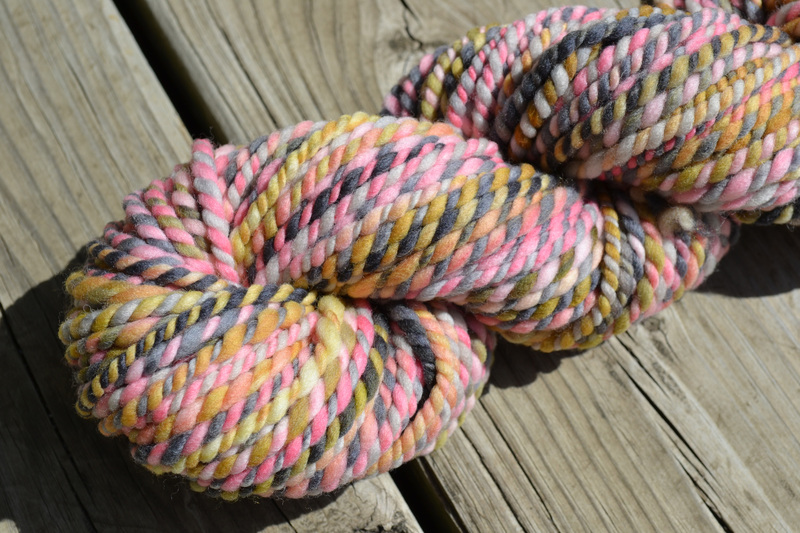 I don’t know why, but I just so often end up spinning chunky 2-ply yarns with my Spun Right Round braids. Can you blame me? 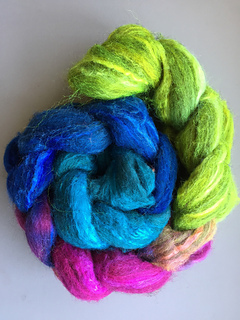 The merino & targhee bases lend themselves especially well to this handling and the colorways are always fun and funky which make for very unique skeins. ‘Dubstep’ dyed on a shetland + silk blend by Northbound Knitting was from their fiber club I tried one spring. I knew from the start that I wouldn’t spin this as a gradient mostly because I had the sneaking suspicion that I would really love it plied. I don’t know why I love this one so much, but I really do. It’s bright and a little crazy and I could squish this one for hours — it’s just got a great feel and is so well-balanced. The craziest part, is that all three of these skeins I whipped up in less than a day. I completed all but the last bobbin of singles in an evening and then finished that and plied the following day. Obviously there’s been more spinning practice the last few months which makes the process go faster, but specifically I think these actually flew off my wheel because I had a much better feel for which whorl would allow me to spin most efficiently. Most notably this does not mean I picked the fastest whorl, but the one that gave me the right amount of twist that coordinated properly with my most comfortable speed of treadling. I don’t recall thinking this through in such detail in the past and clearly it made a very big difference in efficiency as well as the resulting yarns. Since all three skeins were kind of whipped through in the last couple days before the Tour de Fleece began, I haven’t taken the time to measure, weight, or tag these skeins in any way. My best educated guess is that they’re all chunky weight and in the 100-140yard range. I’ll be adding it to the last — oh — dozen or so handspun skeins I have yet to remeasure and properly tag. I think that sounds like an excellent fall or winter project, don’t you? For now, I think I’m just going to go ahead and continue to enjoy this summertime spinning. 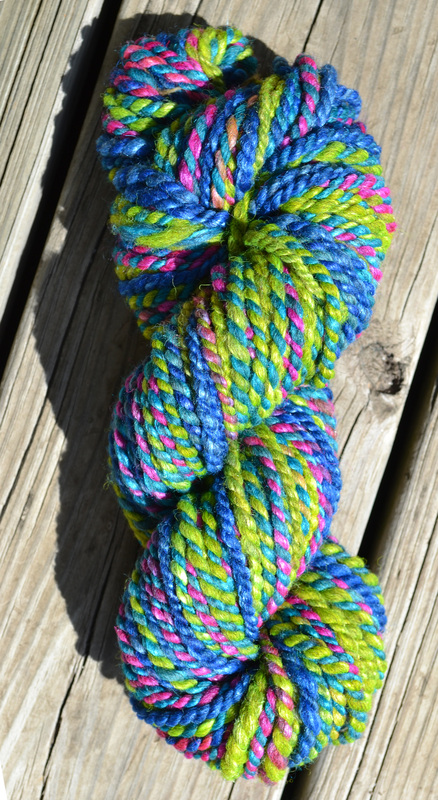 And maybe squish these skeins squishy skeins just one more time. wow – one day???? when you weren’t really feeling well? These are so beautiful, and I love how you read the colors. 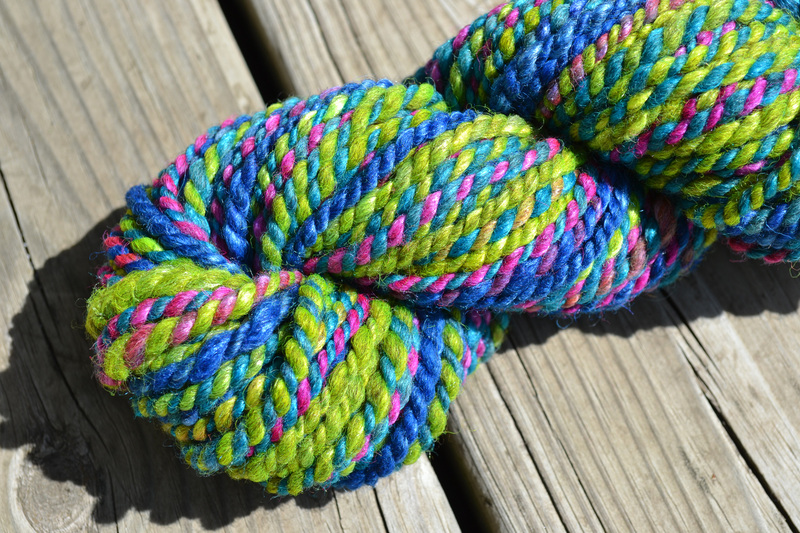 that last one is SO PRETTY plied like that, I think it is way more fun than a gradient would be. And I love the other two as well. Yep! This type of spinning is pretty relaxing for me — think like stockinette stitch in knitting. 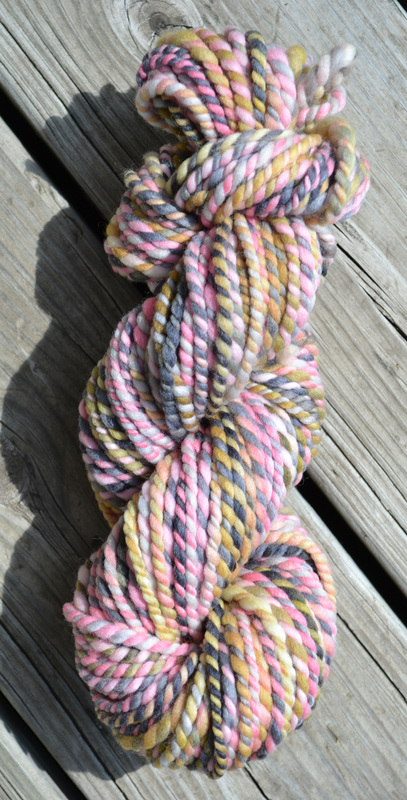 I agree on the last skein — I really couldn’t imagine using it as a gradient, but a chunky fun variegated 2ply I could see. I would love to know how you choose the correct whorl for what you want to spin. Obviously, you nailed it! Your insight is always valuable; I learn so much! Your skeins are so-o-o beautiful. Very simply put, it boils down to getting a feel for how much twist you need/want in the yarn.Chunkier yarn needs less twist, so I use a bigger whorl. Lighter weight yarn needs more twist, so I use a smaller whorl. Which ‘bigger’ or ‘smaller’ whorl I need really just has been a matter of getting to know my wheel and my own spinning. 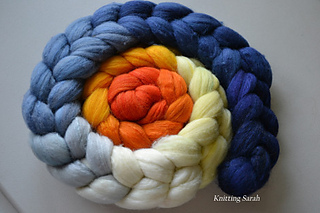 Your yarns are gorgeous, Sarah! I love how they turned out. Well done! Yes! For these I laid them out and kind of eye-balled how the colors were dyed and what would give me less pooling. Then I divided them up into smaller nests — usually one half of each braid I leave with longer color changes and the other half I break up more so I — again — avoid those big sections of pooling in the finished yarn. I wasn’t super picky about these because I spun them when I wasn’t feeling great so they were more of a comfort spin, but that’s the gist of it.